Wedding Cars in Oakham, Stamford, Uppingham and the surrounding areas of Lincolnshire, Rutland, Northamptonshire and Leicestershire. 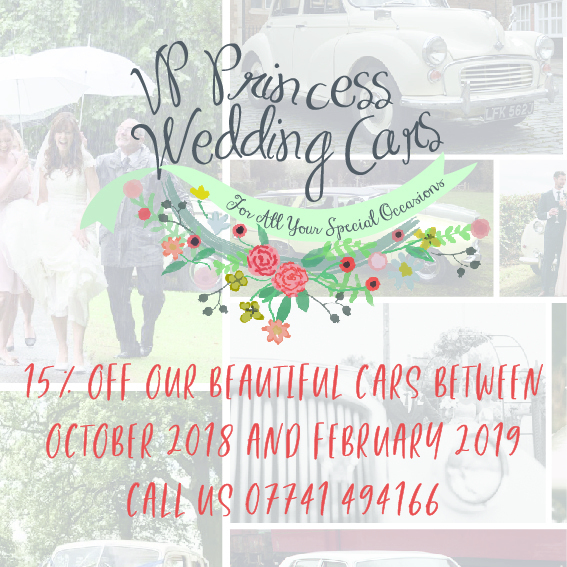 VP Princess Wedding Cars is a well established family run business. We have a fleet of classic limousines that can sit up to eight people- perfect for the bridal party and plenty of space for the bride to sit comfortably! The newest member of the fleet is a Rolls Royce Silver Spirit, complete luxury. We also have some other classic cars for the not so traditional wedding. Oozing in retro style we are sure you will find a car that you will love. On your wedding day your driver will take you to your ceremony, the perfect way to start the day! Once you have said your "I Do"s enjoy your driver popping open a bottle of bubbles to share as a newly married couple, as you are driven to your reception. Our drivers are always happy to stop for any photographs you would like taken, and we love it when a couple sends us some shots so we can see their special day. Our drivers all carry large umbrella's just in case! we also have first aid kits and mineral water on board. If you have a colour scheme we will be happy to provide a ribbon colour of your choice for the cars. Please email us or call us at any time if you have any questions. If you would like to see the cars you are welcome to make an appointment to come and see them.